It’s not uncommon to encounter a situation in which certain chemicals must be added together to produce a final product. Industrial scales can serve as a tool to measure and mix materials at a specific ratio. This is crucial for a number of industries that require exact measurements even when working with volatile, sensitive or perhaps toxic materials. Many of these materials are liquids of varying viscosity, and an accurate measurement of flow rate must be recorded as well. Arlyn Scales has outfitted a number of industries with scales that offer a clear, fast and accurate measurement of flow rate. Because it is so important to get a proper ratio, our scales are smart enough to give you a readout the second your amounts are off, thus ensuring greater quality control. We’re confident we can do the same for you. These scales may be exactly what you need, but if not, contact us to tell us the needs of your company. We are confident that we can accommodate you. Platform Scales One effective scale for this purpose is the platform scale. Platform scales can be placed underneath each drum of material. 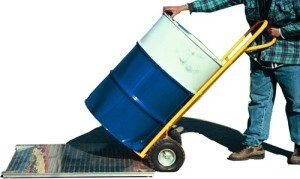 As the material is pumped out of the drum, the digital scale can measure that amount. When the proper amount has been dispensed, the feed can be stopped. This may be controlled by the scale operator. Cylinder Scales Another solution is to hook a cylinder scale up to a feeding device that will shut off automatically once a give amount of material is reached. This process can be duplicated for as many materials as there are in a given formula. Drum Scales A drum scale can be placed underneath a feed system for each product while an operator feeds in proper amounts to get to the final formula. You can install automatic shutoff systems for each component. This is by no means an extensive or complete list of all your options. You can even make accommodations for situations when material of a given viscosity must be dispensed at a certain rate of flow, as is the case with some chemical mixtures. One of the more common cases in which rate of flow is an important part of the equation is in water and wastewater treatment plants. This is because so many chemicals must be added to the water during the process of chlorination and fluoridation. In this case, attention do detail is nothing less than a matter of public safety. You can also accommodate for mixing processes that result in generating heat, or gasses that must be dispersed. The digital indicator can determine the flow rate in pounds per minute or pounds per hour. The user can also enter the specific density of the ingredient, so that the flow rate can also be shown in gallons per minute and gallons per hour. In order to calculate an accurate flow rate, the scale must be able to measure the change in weight during measured time periods. If the flow rate is quite slow, the industrial scale will need a significant amount of time to accumulate a meaningful change in weight. If the flow rate is higher, less time is required. The sensitivity of the scale also determines how quickly it can calculate a flow rate. The greater the sensitivity, the quicker it will be able to show a good value for the flow rate. All of the Arlyn Scale models are able to measure weight with excellent sensitivity levels. Measuring fluids comes with potential hazards, particularly when varying viscosities and stabilities are involved. Another very useful feature of some Arlyn Scales is an alarm system that alerts users to an incorrect flow rate. The most obvious situation in which this could be useful would be when the flow rate decreases to zero, as will happen if the material has been fully depleted from its drum. But there can also be problems if a line is clogged, or a variable valve is stuck in a fully closed or fully open position. A setpoint controller is available on the drum scales, cylinder scales and platform scales. It is usually programmed by the user to provide a visual and electrical signal when the weight in the drum falls below a particular level. This is a notification that the drum should be changed. But those electronic scales that include the flow control feature can also use the setpoint controller to program alarm levels for the flow rate. When the rate falls below a programmed value, a visual alarm and electrical signal are activated. The same can happen if the rate is greater than programmed. These industrial scales are also available with communication capabilities. They may communicate with local computers through an RS-232 serial interface, a USB port, or an Ethernet connection. Alternatively, if the scale is connected into an Internet connected network, the amount of material remaining in the container, and the flow rate, can be monitored from any other Internet connected computer. We have outfitted a wide variety of industries, each of which had specific needs. We can set up a system that will deliver you a reliable digital readout even if you’re mixing volatile fluids, chemicals or compounds of different viscosities, or anything else you may need. Call Arlyn Scales at (516) 593-4465.